Not afraid of any mess. 15 pack for 1 low surplus price! Clean up in Aisle 8! No matter how dirty your shop gets, these Wash Cloths are ready to assist. Absorbent, durable, and if one gets too badly stained there are always 14 ready to take its place. Never been used, ready for years of duty. 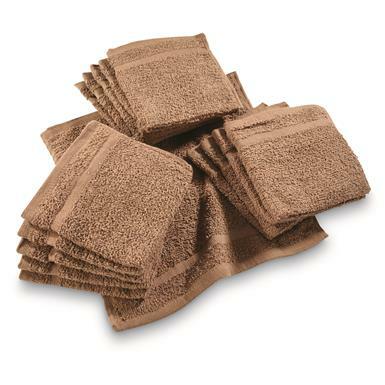 U.S. Military Surplus Wash Cloths, 15 Pack, New is rated 4.3 out of 5 by 6. Rated 1 out of 5 by gbs1x from poor quality I've read all the good reviews for these. I must've received a bad batch. Mine were thin,linty,came apart after a few washings. Same as the towels listed elsewhere. Rated 5 out of 5 by Grayson from Perfect Amount These are great for a bachelor. Perfect for daily use and how often I like to do laundry. Rated 5 out of 5 by sweetpapajohn from Very good quality! Good size. Thicker than most surplus towels. Rated 5 out of 5 by EJCIV from Great Price! Can't beat the price on these and the color matches my decor.